Fr. Paul Kramer, also known as Fr. Paul Leonard Kramer, is a traditionalist layman falsely posing as a priest who currently holds Benedict XVI as “Pope” after considering Francis an impostor and an antipope (more on this below). First of all, it should be pointed out that “Fr.” Gruner was ordained in 1976, after Paul VI’s dubious New Rite of Ordination was introduced. Nicholas Gruner’s good friend, “Fr.” Paul Leonard Kramer, told me himself that he, Nicholas Gruner and “Fr.” Gregory Hesse were all ordained in the New Rite. Thus, none of them can be considered valid priests. Fr. 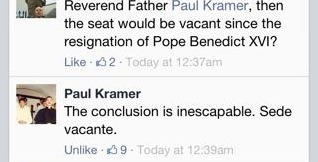 Paul Kramer a Sedevacantist? On November 28, 2013, it was reported that “Fr.” Paul Leonard Kramer rejected Francis as an Antipope. Shortly thereafter, however, it was reported that “Fr.” Kramer announced that Benedict XVI is still the reigning “Pope” instead of Francis (see Update on "Fr." Kramer's Rejection of Francis below). But there were many other heresies taught by the antipopes on various topics that were just as explicit as the one Kramer finds so appalling. He should have been convinced a long time ago. In fact, years ago we personally spoke with Kramer. In one of those conversations he expressed doubts about the validity of John Paul II. However, his rejection of Antipope Francis is interesting because it’s another example of how even some of the most obstinate false traditionalists, who have misled so many for years, are now finding Francis so indefensible that they must reject him as an antipope. It’s a big embarrassment to the false traditionalist crowd. The reason Kramer gives for his new position is that he believes Ratzinger's resignation to have been invalid because it was obtained, so he is convinced, through "coercion". In an interview conducted with him, Kramer claims he has 'inside' information confirming Benedict's resignation to have been forced. (Clearly, this position is entirely untenable, as Benedict himself was never Pope for an instant, and the fact that Benedict XVI himself acknowledges Francis as "Pope" and that his "resignation" was by his own choice.) So this false position -- that Benedict's "resignation" was invalid and he is still the "legitimately" reigning "Pope", and Francis an imposter -- is an outrageous lie and falsehood! The bad willed heretics must just come up with anything and any excuse just to still have a man dressed in robes to follow. 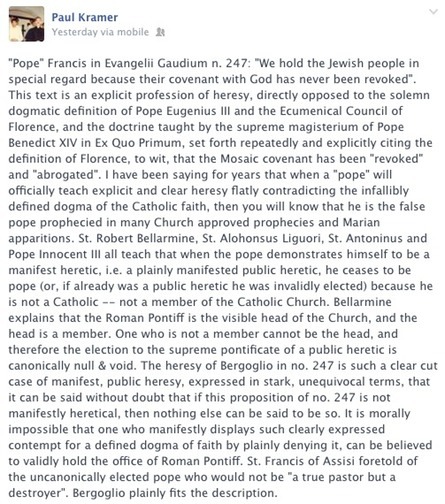 “Rome will be taken over by an Anti-pope, who will be entirely without Catholic faith, entirely heretical…” Hmmm? Whom could that possibly be? Could it be the man who removes the crucifixes from Catholic churches and allows Voodoo high-priests to preach to the people (referring to John Paul II)? Hmmm… could it be the man who declares that all men are saved and that the Holy Ghost is responsible for false religions of Satan? Hmmm… the man who kisses the Koran and asks St. John the Baptist to protect Islam? Could it be the man who praises Martin Luther, the United Nations and the Social Justice of Communist China? How about the man who teaches that there are saints and martyrs in false religions, and that Holy Communion should be given to heretics? How about the man who says that Masses are valid which have no words of Consecration? Hmmm… the man who declares that Christianity is the deep amazement at each man and that man is the Christ, the Son of the Living God? Could it possibly be the man who overturns the Council of Trent, gives donations and relics to non-Catholic sects, and prays with the Jews for the coming of the Messiah? Do the people at The Fatima Crusader and “Fr.” Paul Kramer think that the Antipopes who will overtake Rome will carry signs saying: “I am a heretic!” Do they think that they will announce to the people, “We are the satanic antipopes who are to come!” Any sincere person aware of the facts can immediately recognize that Antipope John Paul II, Antipope Bendict XVI and Francis are “entirely without Catholic faith, entirely heretical…” John Paul II denied the entire Catholic faith and approved of every false religion. Ratzinger denies that Christ is the Messiah! And Francis (whom he currently holds as an antipope) says that one doesn’t even have to believe in God to be saved! This statement is completely wrong. But before explaining why, we will first look into the Church’s teaching concerning all validly baptized Christians (Catholics) who outwardly adheres to non-Catholic sects but that have not yet severed their membership from the Body of the Church since they have not yet embraced any heresy (they are therefore Catholics in non-Catholic churches). 1) The Catholic Church has always taught that anyone (including a layman or a non-Catholic) can validly baptize if he adheres to proper matter and form and if he has the intention of doing what the Church does. This means that the children above reason who were attending the church of a heretical sect with their parents were not heretics because they were not obstinately against something they knew to be taught by the Church! This fact is also true of all people of all ages who go to a heretical church without being obstinately opposed to any Church teaching. This is exactly the Catholic position and what the Church has always taught (as we will see) – which is that to be a heretic one must obstinately reject something they know to be taught by God or the Catholic Church. 2) “Fr.” Paul Kramer's book is particularly pernicious, in fact, because this book pretends to uphold the dogma Outside the Catholic Church There is No Salvation and it will be read in “traditional circles” – all the while rejecting the dogma. The truth of the fact is that it is a divinely revealed truth that God will only save Catholics and those who become Catholics. The statement above literally means that we just don’t know if what God has revealed is true or not. And it shows how prevalent and virulent the Objective-Subjective heresy is, finagling its way into all kinds of places. The truth remains, however, that the Catholic Church teaches that Church membership is necessary for salvation. It nowhere teaches what the modern “teachers” love to say: that Church membership is objectively necessary for salvation. OBJECTION- Objectively speaking, there is absolutely no salvation outside the Catholic Church. But subjectively speaking, we just don’t know. ANSWER- This is similar to the “You Can’t Judge” heresy. Those who advance this heresy deny dogmatic truth; for the Objective-Subjective Heresy means that the dogma Outside the Church There is No Salvation is only true “objectively,” which necessarily means that non-Catholics can be saved “subjectively,” which means that the end result is a denial of the defined dogma. Could a Catholic hold that? No, he could not, because Jesus Christ is not just objectively the Son of God; He is the Son of God – period! But this is exactly what those who hold the Objective-Subjective heresy are saying! For to say that one dogma (Outside the Church There is No Salvation) is only true objectively is to say that any other dogma (e.g., Jesus Christ is the Son of God) is only true objectively. There is no way around this. The Objective-Subjective Heresy asserts the heresy that dogmas are not really divinely revealed truths, but only presumptions or policies that we go by, and this is condemned Modernism. The idea that we can preach that there is no salvation outside the Church while we believe in our hearts that there is salvation outside the Church or may be salvation outside the Church is heretical. That only Catholics can be saved is a truth revealed from heaven which every Catholic must believe first, and profess second. Since dogmas are truths fallen from heaven, to say that any dogma (e.g., the dogma that all who die as non-Catholics are lost) may have a “subjective” reality that is different from the revealed truth is heresy – it is a denial of that truth. Therefore, the idea that subjectively non-Catholics can be saved is blatant heresy; it is a denial of the revealed truth that all who die as non-Catholics are necessarily lost. The same Objective-Subjective heresy was taught in the book The Devil’s Final Battle, as we saw, which is promoted by a number of “traditionalist” organizations. PAUL KRAMER DENOUNCES "ALL FEENEYITES"
First of, even the baptism of desire advocates themselves will agree that baptism of desire is not a sacrament and that it is without water. But the problem with this is that the Council of Trent infallibly defined as a dogma that THE SACRAMENT OF BAPTISM WITH WATER is necessary for salvation! Pope Paul III, The Council of Trent, Sess. 7, Can. 5 on the Sacrament of Baptism, ex cathedra: "If anyone says that baptism [the Sacrament] is optional, that is, not necessary for salvation (cf. Jn. 3:5): let him be anathema." Concerning the Council of Trent objection that “Fr.” Paul Kramer referred to, the following will be said in response. Are the words of Jesus Christ in John 3:5 ("Amen, amen I say to thee, unless a man be born again of water and the Holy Ghost, he cannot enter the kingdom of God.") to be taken as they are written, or not as they are written? All defenders of the theory of baptism of desire must admit that they believe that John 3:5 is not to be taken literally. They agree that baptism of desire cannot be true if John 3:5 is understood as it is written. So the question is: Does the Catholic Church understand John 3:5 as it is written or not? Pope Paul III, Council of Trent, Sess. 6, Chap. 4: "In these words there is suggested a description of the justification of the impious, how there is a transition from that state in which a person is born as a child of the first Adam to the state of grace and of adoption as sons of God through the second Adam, Jesus Christ our savior; indeed, this transition, once the gospel has been promulgated, CANNOT TAKE PLACE WITHOUT THE LAVER OF REGENERATION OR A DESIRE FOR IT, AS IT IS WRITTEN: UNLESS A MAN BE BORN AGAIN OF WATER AND THE HOLY GHOST, HE CANNOT ENTER INTO THE KINGDOM OF GOD (JOHN 3:5)." The reader can see very clearly that the Council of Trent teaches that John 3:5 is to be taken as it is written (Latin: sicut scriptum est), thereby excluding any possibility of baptism of desire. Ironically, the Council defines this in Sess. 6, Chap. 4, the very passage which baptism of desire proponents quote all the time to favor their position. In fact, this passage is brought up by baptism of desire proponents as their single strongest – and perhaps only – argument from the Papal Magisterium. It is their "trump card". Why do they think this? First off, the baptism of desire people believe that the use of the word "or" (Latin: aut) in the above passage means that justification can take place by the water of baptism or the desire for it. But a careful look at the passage proves this to be false. The passage says that justification cannot take place without the laver of regeneration (water baptism) or the desire for it; in other words, both are necessary for those above the age of reason (as we will see). Suppose I said, "This shower cannot take place without water or the desire to take one." Does this mean that the shower takes place by the desire to take a shower? Absolutely not. It means that both are necessary. In fact, the Latin word aut ("or") is used in the same way in other passages in the Council of Trent. In the introduction to the decree on Justification, the Council strictly forbids anyone to "believe, preach or teach" (credere, praedicare aut docere) other than as it is defined and declared in the decree on Justification. Pope Paul III, Council of Trent, Session 6, Introduction: "... the holy ecumenical and general synod of Trent... strictly forbidding that anyone henceforth may presume to believe, preach or teach, otherwise than is defined and declared by this present decree." Does "or" (aut) in this passage mean that one is only forbidden to preach contrary to the Council’s decree on justification, but one is allowed to teach contrary to it? No, obviously "or" (aut) means that both preaching and teaching are forbidden, just like in chapter 4 above "or" means that justification cannot take place without both water and desire. Another example of the use of aut to mean "and" (or "both") in Trent is found in Sess. 21, Chap. 2, the decree on Communion under both species (Denz. 931). Pope Pius IV, Council of Trent, Sess. 21, Chap. 2: "Therefore holy mother Church... has approved this custom of communicating under either species, and has decreed that it be considered as a law, which may not be repudiated or be changed at will without the authority of the Church." Does aut in this declaration mean that the Council’s decree may not be repudiated, but it may be changed? No, obviously it means that both a repudiation and a change are forbidden. This is another clear example of how the Latin word aut can be used in contexts which render its meaning "and" or "both". And these examples blow away the claim of baptism of desire supporters: that the meaning of aut in Chapter 4, Session 6 is one which favors baptism of desire to the exclusion of actually receiving water baptism. Second, the reader should note that this passage from Trent has been horribly mistranslated in the popular English version of Denzinger, the Sources of Catholic Dogma, which is cited above. The critical phrase, "this transition, once the gospel has been promulgated, cannot take place without the laver of regeneration or a desire for it" has been mistranslated to read: "this transition, once the gospel has been promulgated, cannot take place except through the laver of regeneration or a desire for it…" This mistranslation of the Latin word "sine" (without) – which is found in the original Latin – to "except through" completely alters the meaning of the passage to favor the error of baptism of desire. This is important to keep in mind because this mistranslation is still being used by baptism of desire apologists (often deliberately), including in recent publications of the SSPX and CMRI. Looking at a correct translation, which is found in many books, the reader also should notice that, in this passage, the Council of Trent teaches that John 3:5 is to be taken as it is written (Latin: sicut scriptum est), which excludes any possibility of salvation without being born again of water in the Sacrament of Baptism. There is no way that baptism of desire can be true if John 3:5 is to be taken as it is written, because John 3:5 says that every man must be born again of water and the Spirit to be saved, which is what the theory of baptism of desire denies. The theory of baptism of desire and an interpretation of John 3:5 as it is written are mutually exclusive (they cannot both be true at the same time) – and every baptism of desire proponent will admit this. That is why all of them must – and do – opt for a non-literal interpretation of John 3:5. But why does Trent define that the desire for Baptism, along with Baptism, is necessary for justification? Because it is referring to both adults and infants receiving baptism. Therefore, in this chapter Trent is dealing exclusively with those Catholics under the age of reason (infants) who have not committed actual sins, and for such infants receiving baptism only is necessary for justification; while for those above the age of reason (adults) who have committed actual sins, the desire for baptism (and godly contrition) in addition to actually receiving baptism is necessary for justification. The Council of Trent explains this saving sorrow of mind that is necessary for adults "to attain to grace and justice" before receiving baptism. The Council of Trent, Sess. 14, Chap. 1 on the necessity, and on the institution of the Sacrament of Penance: "Penitence was in deed at all times necessary, in order to attain to grace and justice, for all men who had defiled themselves by any mortal sin, EVEN FOR THOSE WHO BEGGED TO BE WASHED BY THE SACRAMENT OF BAPTISM; that so, their perverseness renounced and amended, THEY MIGHT, WITH A HATRED OF SIN AND A GODLY SORROW OF MIND, DETEST SO GREAT AN OFFENCE OF GOD." The Council of Trent, Session 14, Chap. 4 on Contrition: "Contrition, which holds the first place amongst the aforesaid acts of the penitent, is a sorrow of mind, and a detestation for sin committed, with the purpose of not sinning for the future. THIS MOVEMENT OF CONTRITION WAS AT ALL TIMES NECESSARY FOR OBTAINING THE PARDON OF SINS..."
Concerning adults. That is why the chapter defines that justification cannot take place without the water of baptism or the right desire for it. Both are necessary. Not only a godly sorrow for their sins is necessary, but also a right desire to actually receive baptism, is necessary. Catechism of the Council of Trent, On Baptism - Dispositions for Baptism, Tan Books, p. 180: "INTENTION - ... In the first place they [adults] must desire and intend to receive it…"
St. Thomas Aquinas, Summa Theologica, Third Part, Q. 68, Art. 7: "Those who receive Baptism - Reply to Objection 2: If an adult lack the intention of receiving the sacrament, he must be rebaptized. But if there be doubt about this, the form to be used should be: "If thou art not baptized, I baptize thee." St. Thomas Aquinas, Summa Theologica, Third Part, Q. 68, Art. 7: "Whether the intention of receiving the sacrament of Baptism is required on the part of the one baptized? - According to the Church’s ritual, those who are to be baptized ask of the Church that they may receive Baptism: and thus they express their intention of receiving the sacrament. I answer that, By Baptism a man dies to the old life of sin, and begins a certain newness of life, according to Romans 6:4: "We are buried together with" Christ "by Baptism into death; that, as Christ is risen from the dead . . . so we also may walk in newness of life." Consequently, just as, according to Augustine (Serm. cccli), he who has the use of free-will, must, in order to die to the old life, "will to repent of his former life"; so must he, of his own will, intend to lead a new life, the beginning of which is precisely the receiving of the sacrament. Therefore on the part of the one baptized, it is necessary for him to have the will or intention of receiving the sacrament." Concerning infants. The Church has always taught that infants baptized in heretical and schismatic churches are made Catholics, members of the Church and subjects of the Roman Pontiff, even if the people who baptized them are heretics who are outside the Catholic Church. This is because the infant, being below the age of reason, cannot be a heretic or schismatic or have an intention contrary to the validity or effect of baptism. Hence, he cannot have an impediment which would prevent Baptism from making him a member of the Church. Pope Paul III, Council of Trent, Sess. 7, Can. 13 on the Sacrament of Baptism: "If anyone shall say that infants, because they have not actual faith, after having received baptism are not to be numbered among the faithful… let him be anathema." St. Thomas Aquinas also explains why infants does not need to have a desire for baptism and have contrition (or penance as it is also called) as adults always must desire baptism and have contrition in order to receive the full effect and validity of baptism. St. Thomas Aquinas, Summa Theologica, First Part of the Second Part, Q. 113, Art. 3: "Whether for the justification of the ungodly is required a movement of the free-will? - Reply to Objection 1. Infants are not capable of the movement of their free-will; hence it is by the mere infusion of their souls that God moves them to justice. Now this cannot be brought about without a sacrament; because as original sin, from which they are justified [after receiving baptism], does not come to them from their own will, but by carnal generation [or from simply being born], so also is grace given them [not from their own will but] by Christ through spiritual regeneration [in baptism]. And the same reason holds good with madmen and idiots that have never had the use of their free-will." St. Thomas Aquinas, Summa Theologica, Third Part, Q. 68, Art. 9: "Whether children should be baptized? - I answer that, As the Apostle says (Romans 5:17), "if by one man’s offense death reigned through one," namely Adam, "much more they who receive abundance of grace, and of the gift, and of justice, shall reign in life through one, Jesus Christ." Now children contract original sin from the sin of Adam; which is made clear by the fact that they are under the ban of death, which "passed upon all" on account of the sin of the first man, as the Apostle says in the same passage (Romans 5:12). Much more, therefore, can children receive grace through Christ, so as to reign in eternal life. But our Lord Himself said (John 3:5): "Unless a man be born again of water and the Holy Ghost, he cannot enter into the kingdom of God." Consequently it became necessary to baptize children, that, as in birth they incurred damnation through Adam [through no will of their own] so in a second birth they might obtain salvation through Christ [also through no will of their own]." This means that all baptized infants wherever they are, even those baptized in heretical non-Catholic churches by heretical ministers, are made members of the Catholic Church. They are also made subject to the Roman Pontiff (if there is one). So, far from being in favor of baptism of desire, this chapter of the Council of Trent actually goes against it. It defines that justification of the impious cannot take place without the water of baptism or the desire for it, and as we have seen, receiving water baptism is always necessary for justification for both adults and infants alike. We know this interpretation of this passage is correct, because if what baptism of desire proponents say were correct, we would actually have the Council teaching us in the first part of the sentence that John 3:5 is not to be taken as it is written (desire sometimes suffices), while simultaneously contradicting itself in the second part of the sentence by telling us to take John 3:5 as it is written (sicut scriptumest)! But this passage is infallible and there is no contradiction contained therein. So let every baptism of desire supporter cease preaching that Sess. 6, Chap. 4 teaches that justification "can" be effected by water or desire to the exclusion of actually receiving water baptism, which is certainly not what the Council says. Let them cease preaching that John 3:5 is not to be taken AS IT IS WRITTEN: "Amen, amen I say to thee, unless a man be born again of water and the Holy Ghost, he cannot enter the kingdom of God." Let them cease quoting the horrible mistranslation of this passage as it is found in Denzinger (which many of them continue obstinately to do after it has been pointed out to them). And furthermore, let not these people think that they justify themselves before the all-knowing God by ignoring the above facts and continuing to obstinately assert that Sess. 6, Chap. 4 definitely teaches baptism of desire for salvation to the exclusion of actually receiving water baptism. They cannot be justified asserting this even by quoting famous Church theologians, who were mistaken in good faith; for God did not give the charism of infallibility to theologians, however great, but to St. Peter and his successors (the popes) alone (Lk. 22:31-32). Some baptism of desire supporters also bring forward Sess. 7, Can. 4 on the Sacraments to somehow try to prove baptism of desire. But it’s obvious that this canon does not teach that either the sacraments or the desire for them is sufficient for justification, as some claim, but that it condemns those who assert that neither the sacraments nor the desire for them is necessary for justification, and that faith alone suffices. It does not affirm that either is sufficient, but condemns those who assert that neither is necessary. An awkward translation of this canon, as well as the mistaken notion that Trent teaches baptism of desire in another place in Trent (which has already been refuted), has led to this erroneous assertion. In fact, we will see that the truth is just the opposite of what the baptism of desire advocates claim. Let’s take a look at the canon. Pope Paul III, Council of Trent, Sess. 7, Can. 4, On the Sacraments: "If anyone says that the sacraments of the new law are not necessary for salvation but are superfluous, and that people obtain the grace of justification from God without them or a desire for them, by faith alone, though all are not necessary for each individual [only baptism is necessary absolutely]: let him be anathema." When one carefully examines this canon, he sees that it is not declaring that either the sacraments or the desire for them is sufficient for justification; but rather it is condemning those who would say that neither the sacraments nor the desire for them is necessary for justification. I repeat, it is not declaring that either is sufficient; it is condemning those who would say neither is necessary. Precisely, it is condemning those who would say that neither is necessary and that faith alone suffices. Consider the following canon that I have made up: "If anyone says that the Virgin Mary possesses the Queenship of Heaven without God’s permission or her being worthy of it, but assumes this Queenship by usurpation alone, let him be anathema." The sentence construction of this imaginary canon is similar to the canon we are discussing. Consider it carefully. After considering it, I ask: does this canon mean that the Blessed Mother possesses her Queenship solely by "her being worthy of it"? No, she must also have God’s permission. The canon does not say that either "her being worthy of it" or "God’s permission" is sufficient for Mary to possess the Queenship. Rather, it condemns those who would say that neither "God’s permission" nor "her being worthy of it" is necessary. In other words, the canon is condemning those who would say that both God’s permission and Mary’s worthiness are useless, since she assumes the Queenship by usurping it. Likewise, canon 4 above does not say that either the sacraments or the desire for them is sufficient for justification; it condemns those who would say that both the sacraments and the desire are unnecessary in obtaining justification, since faith alone is all one needs. Canon 4 does not in any way teach the possibility of baptism of desire. It is also quite interesting to consider that whereas the Council of Trent never teaches baptism of desire, it teaches no less than three times (twice in Sess. 6, Chap. 14 and once in Sess. 14, Chap. 4) that the desire for the Sacrament of Penance (if a person has perfect contrition) can suffice for justification before Penance is actually received. This efficacy of the desire for the Sacrament of Penance is mentioned three times, but the supposed efficacy of the desire for baptism (baptism of desire) is not mentioned at all. This should indicate something to those who believe in baptism of desire: God didn’t allow it to be taught in the infallible Council of Trent or any other Council or even in any Papal encyclical in the history of the Church, because it is an erroneous theory. John 3:5 is true exactly as it is written (Trent, Sess. 6, Chap. 4). If the concept of baptism of desire were a true teaching of the Church, then the Council of Trent definitely would have included it in the canons on Baptism or in the chapters on Justification. But it’s nowhere to be found. It’s also noteworthy that the terms baptism of desire and baptism of blood are not found anywhere even in The Catechism of the Council of Trent - contrary to what many assert. I was glad to hear that "Fr" Kramer rejected antipope Francis. However it's sad that he still blinds himself to the other five apostate antipopes. I listened to a talk by Kramer and another quite well known priest from years ago. The talk was on the Antichrist and the False Prophet. They both believed the false prophet would be an antipope. Listening to this talk is a very strange experience. They mention so many things that the false prophet/Antichrist would do for people to know who they are. Everything they mention fits John Paul II (Antichrist) and Benedict XVI (False Prophet). Here are some quotes said by Kramer and the other priest. "Masonry will install an antipope… Saints have predicted an Antipope. It's going to happen in the very near future." "It has been foretold that there will be a worldwide super "church" an ecumenical umbrella" (V2 "Church"?). Other priest: "Yes father, and what he will do is simply recognize all other churches as being equal to the Catholic Church. He will simply, perhaps not even in words. But by his actions he will accept all other religions as valid, though alternate ways of worshiping God." Now here comes the nonsense Kramer says "So far nothing like this has happened yet." He then mentions Assisi and that John Paul II whom he calls "holy father" learned his lesson. Which is funny because years later antipope John Paul II held another apostate Assisi meeting. Yet Kramer didn't catch on then? It's truly mind blowing that he rejects Francis as an antipope but accepts the others. I don't know what to make of it. Hopefully he might take your material seriously and come around. You bring up some very good points… You write: “He then mentions Assisi and that John Paul II whom he calls "holy father" learned his lesson. Which is funny because years later antipope John Paul II held another apostate Assisi meeting. Yet Kramer didn't catch on then?” The answer is that at some point they knew those antipopes fit the very description they gave of apostate false popes. But since they serve man and Satan instead of God, they simply don’t tell the truth as it is. Instead, they conform and change the message to make it more palatable to people. Yes, it’s outrageously illogical and dishonest. He knows that Francis cannot be considered a true pope (and that the sedevacantist position is true), but he simply doesn’t want to admit that he was wrong about Benedict XVI, etc. Thus, he pretends as if Antipope Francis has just now crossed some line (or taught some manifest heresy) that the others did not, when that is clearly not the case. They were all manifest heretics. Vatican II itself, which was authoritatively promulgated by Antipope Paul VI and endorsed by the other antipopes, formally and officially teaches the very heresy Kramer (rightly) believes proves that Francis is not the pope. Thank you for the post about "Fr." Paul Kramer accepting the sedevacantist position. Unfortunately, Kramer appears to be unbending about believing that there is to be only one antipope ruling from Rome, rather than six. As you said, Kramer should have been convinced years ago. The heresies gushing out of the Vatican have all been just as obvious and opposed to Catholic teaching as Francis' recent one in Evangelii Gaudium, that the "Jewish covenant with God has never been revoked." MHFM's work proves many times over that Vatican II is full of such heresies. The pride of false traditionalists like "Fr." Paul Kramer and "Fr." Nicholas Gruner is shocking. It shows they don't care about the faith, but only about man and his opinions. Hopefully Kramer's move will help some to move out of the dark and into the light of the true positions of the Catholic faith. Ecclesiasticus 5:8,9 - "Delay not to be converted to the Lord, and defer it not from day to day. For his wrath shall come on a sudden, and in the time of vengeance he will destroy thee."